The Coosa River and its tributary streams occupy most of the northwest corner of Georgia and extend through northeast Alabama before ultimately draining into the Gulf of Mexico. The river is one component of the Alabama-Coosa-Tallapoosa (ACT) river basin system. The Coosa River Basin, comprising all land areas draining into the river above the confluence with the Tallapoosa River near Wetumpka, Alabama, occupies a total area of about 10,059 square miles, of which 4,579 square miles (46 percent) lie in Georgia, 5,353 square miles (53 percent) lie in Alabama, and 127 square miles (1 percent) lie in Tennessee. The Coosa River itself is formed by the confluence of the Oostanuaula and Etowah Rivers in Rome, Georgia. The Oostanuala River in turn is formed by the confluence of the Conasauga and Coosawattee Rivers. The basin also contains the Chattooga River of northwest Georgia (not to be confused with the Chattooga River of northeast Georgia), which joins the Coosa River in Alabama. Total wetland acreage based on Landsat TM imagery is 8,572 acres or 0.3 percent of land in the Coosa River Basin. Conasauga River: The Conasauga River flows in a northerly direction for about 13 miles from its beginning near Blue Ridge, Georgia. It then flows west 13 miles where it bends, after emerging from the mountains, and flows south for 62 miles. There it joins the Coosawattee River near Resaca and forms the Oostanaula River. Coosawattee River: The Cartecay and Ellijay Rivers form the Coosawattee River at Ellijay, Georgia. The river drains an area of 865 square miles, and flows 48 miles from its source, in a generally westward direction, to its juncture with the Conasauga River. Salacoa Creek, with a drainage of 241 square miles, is the largest stream contributing to the Coosawattee River. The headwater streams, Cartecay and Ellijay Rivers, drain areas of 136 and 92 square miles, respectively. Oostanaula River: The Oostanaula River flows south from its source at the juncture of the Conasauga and Coosawattee Rivers for 47 miles to join the Etowah River at Rome. The Oostanaula basin has an area of 2,150 square miles, all of which, except for 140 square miles of the Conasauga River area, are in Georgia. Etowah River: The Etowah River begins in the Blue Ridge Mountains near Dahlonega and flows about 150 miles south to its confluence with the Oostanaula River at Rome. The basin drains an area of 1,860 square miles in Georgia. The principal streams contributing to the Etowah River are the Little River of Georgia which drains a 210-square-mile area, and Euharlee, Pumpkinvine and Allatoona Creeks. Coosa River: The Coosa River, from its beginning at the juncture of the Oostanaula and Etowah Rivers at Rome, flows in a westward direction for 30 miles into Alabama before flowing south past Gadsden and Childersburg, joining the Tallapoosa River just south of Wetumpka to form the Alabama River. The total drainage area for the Coosa basin is 10,161 square miles. Approximately 4,400 square miles are in Georgia and Tennessee with the remaining area in Alabama. The Conasauga River ranks first in imperiled species in the Coosa River Basin. No threatened and endangered mussels remain in the Etowah. There are 87 fish species, representing 17 families. There are many freshwater fisheries, including Rocky Mountain Public Fishing Area, Carters Lake, Lake Allatoona, and a land-locked striped bass population on the Coosa River that is one of the few in the U.S. that is naturally reproducing. Aquatic gastropods (snails): There are 82 species in the entire Coosa River Basin (TN, AL, GA). There are 30 species in the Upper Coosa (GA and TN) with one being extinct and 2 extirpated. Thirty-five species have gone extinct from the Coosa River Basin in Georgia and Alabama. Amphibian Species: 37 species of amphibians exist in the Coosa River Basin. 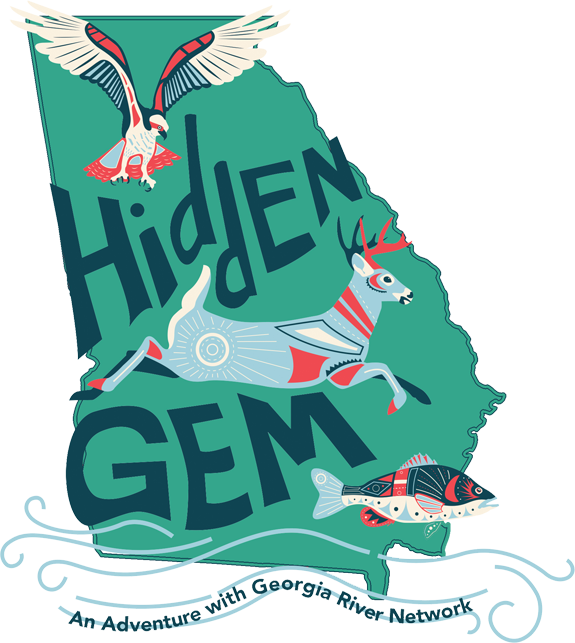 Of the 37 species, 9 are considered of “Special Concern” by the Georgia Natural Heritage Program. Eleven species of freshwater mussels, native to the Coosa River Basin, are currently listed as endangered or threatened. Seven species are now extinct. Communities within the basin are permitted to withdraw about 124 million gallons a day (MGD) from surface and groundwater sources. The single biggest water user in the basin is actually located mostly outside the basin. The Cobb County Marietta Water Authority is permitted to withdraw about 65 MGD from Lake Allatoona and pumps it out of the Coosa River Basin for use by homes and businesses located in the Chattahoochee River Basin. Each day, the Coosa River Basin loses about 25 MGD through this inter-basin transfer. The primary water source for the carpet industry is the Conasauga River. Each day, Dalton Utilities is permitted to withdraw about 37 million gallons from the Conasauga and other water sources to fuel the water-intensive carpet manufacturing process. During summer months, as much as one-third of the Conasauga’s flow is removed to meet the demands of the area’s carpet industry, other businesses and residences. Three different poultry processing facilities use water from the streams of the Coosa River Basin in their processes. NPDES Discharges: As of 2018, there are approximately 147 facilities, including industries and municipalities, authorized to discharge wastewater into the Coosa River Basin pursuant to NPDES permits. Georgia Power Company operates two large fossil fuel, power-generating facilities: Plants Bowen and Hammond. Plant Bowen withdraws water from the Etowah River and Plant Hammond withdraws water from the Coosa River. As of 2018, the EPD had issued 203 agricultural water withdrawal permits in the Coosa River Basin. The Coosa River Basin contains three major dams: Weiss Dam, Allatoona Dam, and Carters Dam. Weiss Dam is an Alabama Power Company facility that extends into Georgia. The Allatoona Dam and Carters Dam are U.S. Army Corps of Engineers facilities. Major threats and current stressors to the river and its tributaries include dams, sprawling development, poor agricultural practices, toxins left by several industries, and non-native species. There are elevated levels of Polychlorinated biphenyls (PCBs) in the tissue of bass, catfish, and crappie caught by state scientists in a 200-mile stretch of the Coosa River from Rome to Lay dam. Much of this contamination in the upper portion of the Coosa River basin is traced to General Electric’s former transformer assembly plant in Rome. In the Coosa River Basin, there are approximately 70 rivers and streams listed on the 2012 integrated 305(b)/ 303(d) list as waters not meeting their designated uses. These impaired waters include roughly 1,130 miles of rivers and streams in the Coosa River Basin. The Coosa River from the confluence of the Oostanaula and Etowah Rivers to the Georgia-Alabama line, and all streams flowing into the Coosa River between those two points, have been closed to commercial fishing since 1976 due to contamination of fish tissue by PCBs. Fish tissue quality has improved in the Coosa River with declining PCB residues, but 2 out of the 6 tested species still carry recommendations not to eat, and only one species has no restricted consumption recommended.